Take a little extra power with you. The Flip 10 has a 2,600mAh battery that can top up your favourite USB powered devices. Charge status light. 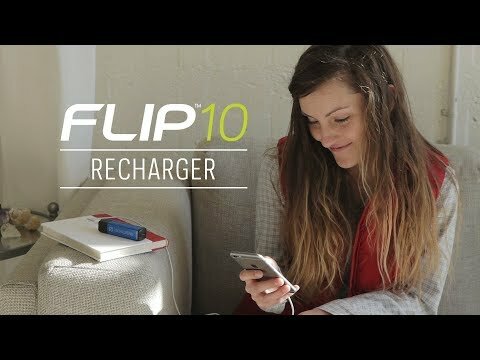 You can charge your device while the Flip 10 is being charged. Input is USB A Male, 5V, up to 1A (5W max). Output is USB A Female, 5V, up to 1A (5W max), regulated. 2,600mAhlithium nickel manganese cobalt oxide battery offer lower energy density, but longer life and more inherent safety. Charge time via USB is about 2.5 hours.